Jim McKay was headed for combat as his troop ship left New York in November, 1944. The young battalion surgeon left his bride Liz behind for an ordeal that shaped his life. Jim would write his bride nearly every day for the next 20 months. His letters portray an ambitious young doctor struggling to treat the 500 men of his battalion, lead his medics, and keep himself sane while longing for the woman he left behind. Within a week of landing, Jim’s battalion was thrown into the Battle of the Bulge. Through the next four months of combat and 16 months of occupation, Jim described the scene around him, his anger and frustration, his challenges and rewards, and his love for Liz. He emerged a top notch doctor with a world view that carried him through his long life, and experience that made him one of the most respected pediatricians in America. Well educated and sophisticated, already fluent in German and French from time spent in those countries before the war, Jim’s view of Europe was quickly shattered. After a week of combat his pre-war respect for German culture turned to revulsion and a conviction that Germany must be ground into the dust. After the war, he was assigned to establish a hospital in Germany. Through his letters we see him come to terms with the defeated Germans around him, including the German family he had lived with for four months in 1935, who were struggling to survive in their devastated homeland. The author is Jim’s son Tim, who spent many days with his father, reading aloud the big box of letters that form the basis for the book. Tim weaves excerpts from Jim’s letters with the memories they provoked and fascinating background from research into his father’s battalion, both at the National Archives and in Europe. This book is history seen through a pure lens, namely the letters written every day of the experience, unfiltered by the years of storytelling and postwar experience that affect most wartime memoirs. 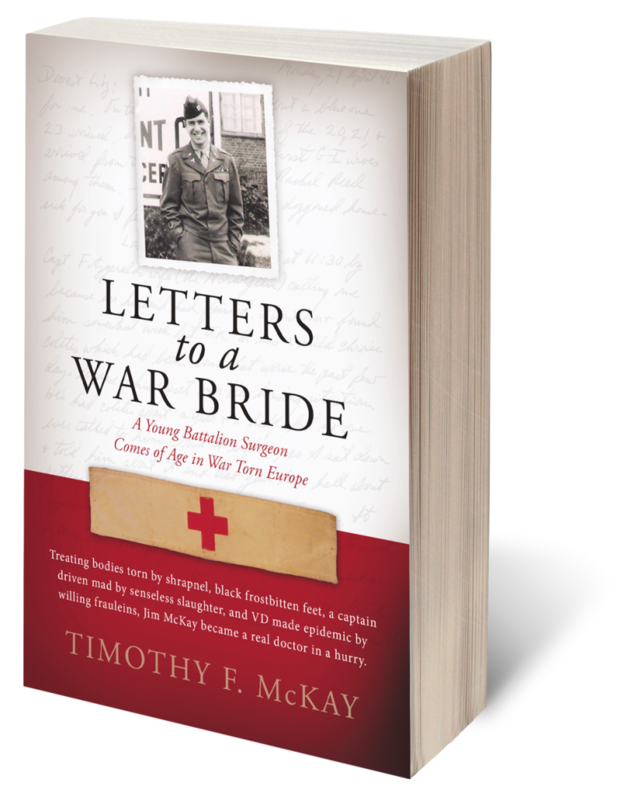 Letters to a War Bride is both an intimate portrait of a driven, honorable, and loving man, and a fascinating glimpse into those formative years of the Greatest Generation.